If you’re like me you’ve been baking pumpkin flavored anything and everything since before Labor Day no matter what people may have said about it! I’ll admit after testing over 100 pumpkin recipes over the summer and a lot in August for my Once Upon a Pumpkin Cookbook, I took a little break from the baked goods right after Labor Day. We headed out of town to celebrate my best friend’s from college wedding, so it was the perfect time for a quick little break. Maybe by now you’ve heard, but if you haven’t my first cookbook, just released this month is number one in the fruit cooking category on Amazon (pumpkin is a fruit after all!). Once Upon a Pumpkin: 50 Creative Pumpkin Seasoned, Flavored, Shaped, and Spiced Recipes is packed with everything from gluten-free recipes, to paleo friendly recipes—there’s truly something for every pumpkin lover within its pages! There’s even a recipe perfect for your pooch, because pumpkin puree is good for dogs too! 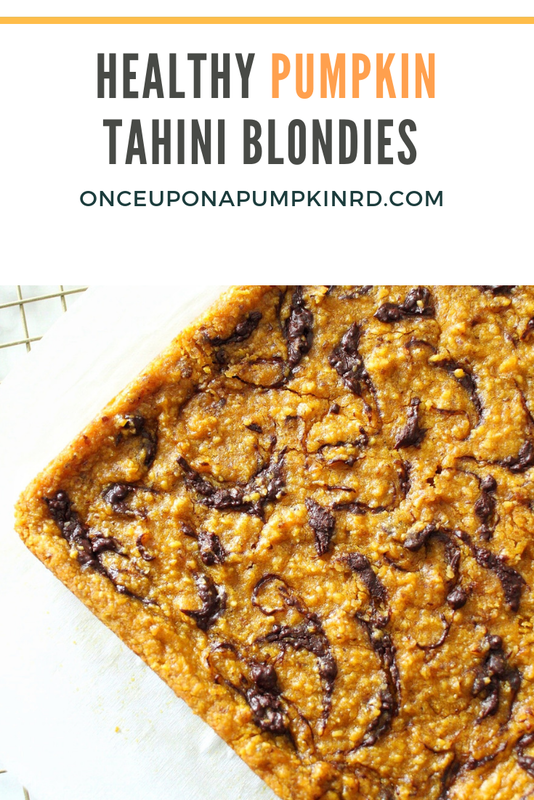 So I as get back to baking all things pumpkin full force, I took my first stab at baking with tahini for these pumpkin tahini blondies! I’ve seen people bake brownies and blondies using tahini, but have never used it myself until now! These are perfect to make if you’ve got leftover tahini from making hummus in your fridge, and why not add in the infamous flavor of the season for even more nutrition per bite. Tahini is paste made from toasted sesame seeds, and contains about 5 grams of protein per 2-tbsp. serving and 14% of your daily requirement for iron (a mineral a lot of us don’t get enough of!). In paste form our bodies are able to absorb some of the nutrients better from the sesame seeds, all the more reason to get creative with it in the kitchen. 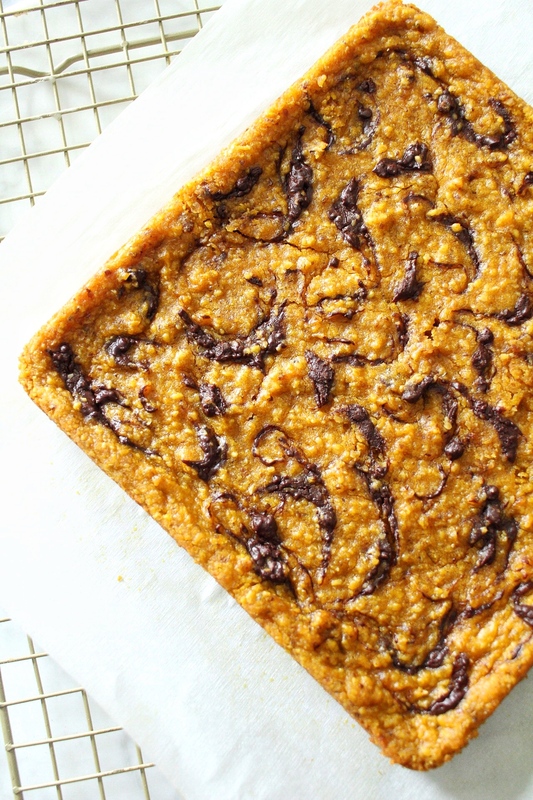 This pumpkin tahini blondie recipe is only lightly sweetened with maple syrup, and gets some of it’s sweetness from the unsweetened applesauce, and chocolate on top.For the swirl I used melted dark chocolate, but milk chocolate would work too. Did you know that chocolate with high concentrations of cacao ( at least 70%) can reduce stress and inflammation while also improving, memory, immunity and mood? I think we all new chocolate could improve our mood, but here’s to more reason to keep the dark stuff in your cabinet! 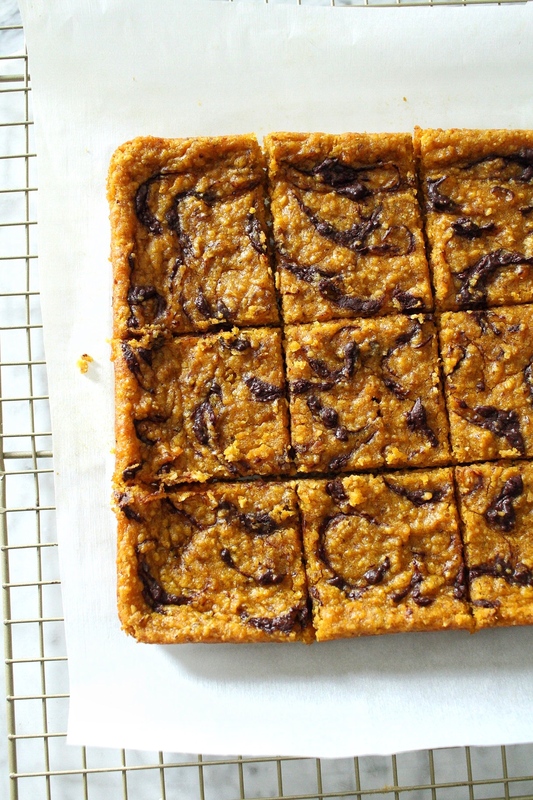 Pumpkin being the fall superfood that it is adds fiber, vitamins A & C, and potassium to these blondies and really contributes to the moist texture. It paired really nicely with the tahini and I think you’ll love it if you’re looking for something not overly sweet but pumpkin-y. On a beautiful fall afternoon with a slight chill in the air fall baking can be so magical. Bring some pumpkin into your kitchen like I know you want to with this recipe! These pumpkin treats will surprise you with their delicious taste! Pumpkin bursts out of every bite, and you get a hint of sesame from the tahini that proves for a delicious combination. The swirled chocolate gives them that slight sweetness that is perfect for this better-for-you dessert! Preheat 350 degrees and grease an 8×8 or 9×9 baking dish with coconut oil. In a food processor, pulse the oats until it resembles flour. Set aside. Make the flax egg in a small bowl, and then add the coconut oil, pumpkin puree, maple syrup, unsweetened applesauce, tahini, vanilla extract. Mix together. Mix in the oat flour and baking powder until well combined. Pour batter into greased pan and using a toothpick, swirl the melted chocolate into the top of the batter. Bake in oven for 27 minutes, allow them to cool and enjoy! Store in an airtight container in the fridge for a week and reheat in the microwave to enjoy when you want one. To make this recipe gluten free, substitute gluten-free oats for regular.